I received this special gift last month from my circle group. It's a picture of the parents of St. Josemaria, or who we fondly call "Abuela and Abuelo". 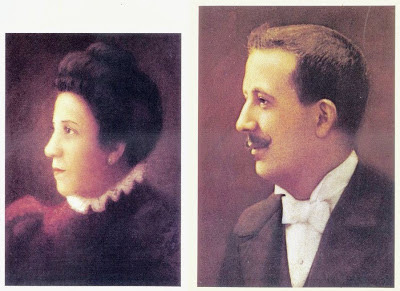 If you watched the movie "There Be Dragons" you will see there a snippet of the simple lives of Don Jose and Dona Dolores Escriva. They were a Catholic couple whom God had chosen to be seedbed for the vocation of a great saint. They had filled the Escriva home with love and cheerfulness that even though God had sent them many trials and hardships in life (at one point, they lost their 3 younger daughters and went bankrupt). It was almost unimaginable how they faced all these problems with a lot of faith in God and serenity. Reflecting on their lives, I would naturally would go to them for inspiration (and ask them for favors!) especially whenever we feel the pinch. I would think about how the Abuela maintained her dignity and elegance amidst severe money troubles and the lack of even the family's basic needs. I would also imagine how the Abuelo, while he lost his business and received the ire of many, continued to work and find ways to fend his growing family with true trust in God.